Stylish & exclusive with all the conveniences of a home away from home. Villa Aura is a beautifully designed 3 bedroom villa, which comfortably sleeps 7 +cot. It is child & family friendly with everything you might need for a relaxing holiday. 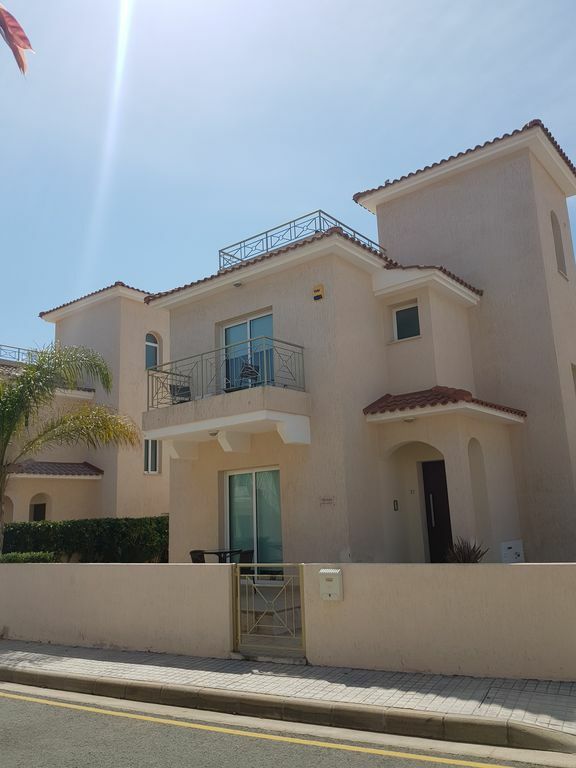 With porcelain tiled flooring throughout, lovely marble staircases and granite counter tops, Villa Aura has WIFI, remote air con/heating units and ceiling fans in each room, 2 TVs, DVDs, & PS2 + games. Its fantastic private pool includes inflatables, outdoor shower, a serene lounging area with pretty garden, an outdoor BBQ, dining area, as well as the "piece de la resistance" - a romantic roof terrace with breathtaking views of the Mediterranean Sea. There is off road parking, although with only a 2 minute walk to local tavernas and restaurants and a 5 minute walk to the nearest sandy beach, a car is hardly necessary. A 5 minute taxi ride takes you to the lively town of Protaras or 15 minutes drive and you are in Ayia Napa with its vibrant night life. We have fallen in love with Pernera because of the fantastic facilities in the area as well as the hospitable and helpful people. We chose the position of villa Aura because the sun shines on the pool area all day. Perfect! Walk around the corner from our villa and you will be right in the heart of this friendly little Cypriot town with its many restaurants, bars and tavernas. You can be as busy or quiet as you decide. Another 5 minutes walk and you are down at the beach with loads of water sports and activities. Walking 20 minutes along the beautiful wooden boardwalk takes you to the next town of Protaras with a vibrant night life. The best water park ever is also only a 20 minute ride away and our villa is only a 40 minute drive from Larnaca airport. There is no need to bring anything to villa Aura except yourselves with a minimal amount of clothes! We have everything from the private pool and all its inflatable toys, to TVs, PS2, DVDs, washing machine, dishwasher, cot, baby monitor, pool towels and just 5 mins walk away are the beautiful sandy beaches with many water sports and the new wooden 'promenade' which takes you right along the coastline to Protaras the next lively town. We have a fantastically romantic roof terrace and our pool is in full Cyprus sunshine from dawn until dusk. You can be as peaceful or busy as you like here, with lots of things for the kids to do or you can just chill and people watch with a cool drink. En-suite to the master bedroom with shower. The attractively tiled main bathroom has a wonderfully big bath to relax in as a 'grown-up' or play in - with kids toys! Includes an overhead shower. The downstairs WC is a practical but pretty addition. We also have an outdoor shower by the pool. No need to bring heavy suitcases - travel light and wash your things to wear again as clothes will dry on the airer in the lovely sunshine and we have an iron too. On the driveway or outside on the quiet road of our gated community. Both bathroom and beach towels provided. Open plan lounge/dining room with 32' flat screen TV with Satellite, DVD player with extensive DVD collection for all ages, Hifi system/CDs/IPod docker and USB connection, 2 chocolate faux leather sofas, (1 a sofabed) and modern dining table seating 8. Everything in the villa that you might need. Please use only plastic glasses out by the pool, thank you. Villa Aura's contemporary kitchen with luxury granite worktops includes built in appliances - cooker, halogen hob, fridge, freezer, dishwasher, washing machine, as well as microwave, toaster, kettle and plasticware for kids or even picnic use by the pool. Both inside and al fresco! 2 TVs with playstation, games and lots of DVDs. We provide a DVD player with lots of DVDs. Books are located in the sideboard. CDs and Docking station with facility to play music. We provide a Play station 2 with lots of fun games. Really close to the marina with lots of boat rides or the beach with many water sports. Out front terrace with table and chairs for reading and drinking morning coffee. Roof terrace with ratan furniture and panoramic views. Cyprus is a wonderful island of contrasts. Where else could you ski in the morning and then be sunning yourself by the pool or on the beach in the afternoon? There are many golf courses in Cyprus and more new ones being developed every year. For wheel chair users there is only one large step to both the front and back of the villa - easily wide enough to sit on while opening the door. The downstairs sofabed with comfortable sprung mattress offers perfect sleeping accommodation for those with difficulty in negotiating stairs. Beautiful - south facing - lots of sun all day with sun beds or chairs and big parasol. Outdoor table and chairs for eating al fresco are also out by the pool. We stayed in Villa Aura with our daughters, partner and grandson of 17 months. It was ideal for us, being equipped with all you could ever need to keep a toddler safe and entertained. As a result we all had a lovely relaxing time. The villa is spacious, well equipped and close to amenities and beaches. Gillie was very help and accommodating throughout. I can’t recommend Villa Aura highly enough. A great Villa , with everything you need especially for little ones. The Villa is in a safe, quiet area , but within easy walking distance of bars and restaurants and the lovely beach. Ideal area for families. The Villa is very comfortable , spacious and great to have washing machine and dishwasher to make life easy. Loved the roof terrace and pool. Great location, super roof top terrace, relaxing sun drenched patio, it's a must!! We stayed for 2 weeks Aug-Sept Beautiful Villa with everything you could need. Great location and very helpful people looking after it. This was our second stay and would definitely return. 5 minutes walk from the villa are various picturesque coves and beautiful beaches making up the coastline of this quaint corner of Cypriot landscape. You can go fishing or have fun on all sorts of boats from glass bottomed to banana boats or even just laze all day on a sun lounger in the sand. Snorkeling or diving are popular, as the magnificent marine life & visibility are second to none. A newly built boardwalk with stunning views of the Mediterranean links Pernera to the famous Fig Tree Bay. Larnaca is the closest airport at about 40 minutes drive away from the villa with departures from most UK airports. It is a brand new airport which opened in Dec 09 to cope with the growing popularity of this side of the island. It is not essential to hire a car as we are perfectly located within walking distance of some of best restaurants in this area as well as the beach, although there are many sights like the Troodos mountains for which a rental car would be useful. Villa Aura in Pernera is located a mile away from the next town of Protaras, easily accessible either by taxi from the local taxi rank or bus, or even on foot along the new promenade in 15 minutes. We have a small supermarket round the corner from us for most of your needs, but if you require a big shop just hop in a taxi and Paralimni is a 5 minute drive away with a couple of bigger supermarkets at very competitive prices. Ayia Napa is a 15 minute drive away. We have fallen in love with this friendly little town of Pernera not only because of all the easy-to-access amenities, restaurants, tavernas and bars within walking distance - preferable if you like to have a glass of wine or two - but also because of the many things to do - like WaterWorld Water Park, Ayia Napa – great for the whole family and located in Ayia Napa, WaterWorld is the largest water park in Europe and is about 20 minutes away from Villa Aura in a taxi. Or Ocean Aquarium Park in Protaras – open all year round. The Ocean Aquarium Park is home to over 1,000 different marine species. A great day out! Paralimni is a 5 minute drive with a couple of big supermarkets and a maze of little streets where you can find quaint little coffee shops and boutiques for those who love to shop. The more lively Ayia Napa is a 15 minute drive away with night clubs and bars for those who like to dance the night away. Booking Notes: We require a booking/security deposit of £200 with your balance being payable eight weeks prior to arrival at the villa. This security deposit is returnable within two weeks of check out as long as we have no issues or damage to our Villa Aura. Payable by bank transfer or cheque. As soon as we have received the full balance of payment we will send directions to Villa Aura as well as key codes for entry and use of the safe. Deposits are non refundable and balances are non refundable within 60 days of departure. Changeover Day: We are flexible on change over day depending on the preceding and following bookings. Check-in is 3 pm and check-out is 11 am, which again we may be able to be flexible with. Notes on prices: Prices are per week in UK pounds. Please contact owner if you require pricing for a long winter let.